Signed as a free agent on Aug. 14, 2018. 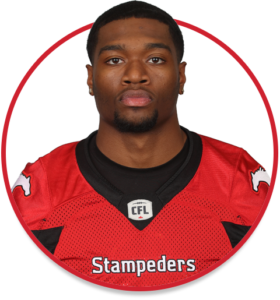 (Calgary) Cozart joined the Stamps on Aug. 14 and served as the No. 3 quarterback for the regular season’s remaining 11 games as well as the Western Final and Grey Cup. He did not see any game action. Cozart played his senior season (2017) at Boise State, completing 61 of 97 passes for 754 yards and 10 touchdowns with just one interception. He also carried the ball 86 times for 361 yards and four majors. He started his collegiate career at Kansas, playing 27 games over four seasons (2013-16). Cozart was granted a medical redshirt season following the 2015 campaign after suffering a season-ending shoulder injury prior to the Jayhawks’ fifth game. At Kansas, he completed 265 of 487 passes for 2,755 yards and 14 touchdowns and carried the ball 191 times for 481 yards and two scores. Cozart earned first-team all-state honours after leading Bishop Miege High School in Roeland Park, Kan., to the Class 5A state title in 2012. He threw for 2,759 yards and 25 touchdowns during the Stags’ championship season. He also excelled in basketball at Bishop Miege. Prior to transferring to Boise State, he completed his degree in sports management at Kansas.